The mistranslation of zìfù 自负 as "proud" comes from the fact that it means both "bear the responsibility oneself" and "be conceited". Microsoft Translator gives "The consequences are conceited". Baidu Fanyi has "Consequence conceit". Google Translate has " Conceited at your own risk". In other words, they all produce gibberish. Once again, I must stress that machine translation does not work for Literary Sinitic / Classical Chinese, though it certainly engenders a lot of mirth. "'Do not accept Taiwan' " (2/1/19) — Conclusion: " Moral of the story: you are less likely to confuse humans and machines if you write in vernacular." 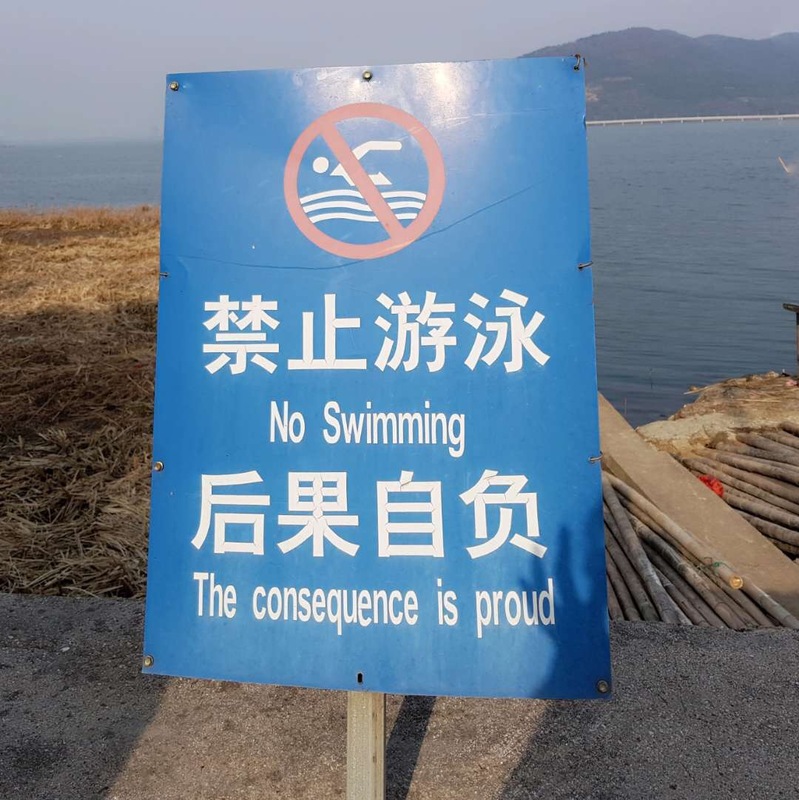 I was going to comment on the difference between the "no swimming" here and the idiomatic American "swim at your own risk" — which tells you that you will be responsible for the consequences, but also doesn't prohibit you from swimming. That certainly isn't the case here; the top line says "swimming is forbidden". But I'm even more curious about the Google Translate rendition of 后果自负. 后果, "result", is untranslated, while "conceited" and "at your own risk" are mutually exclusive translations of 自负. How can that happen? Google Translate is also willing to offer (me, at least) "at your peril" as an alternative for 后果自负 (hòuguǒ zìfù). So I guess if you use machine translation, the consequence is proud. GT gives me "Conceited at your own risk" (as per the o.p. ), with "at your peril" as a less preferred alternative. That's only useful if you already understand English, and know that the first offering makes no sense. 'Conceited at your own risk' sounds like good advice for many situations, just maybe not this one.